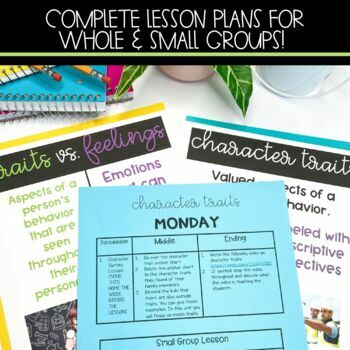 A weeks worth of engaging lesson plans to teach character traits, motivations, and feelings. These lesson plans are designed to be low prep for the teacher, but keep your kids engaged the entire week! There is a whole group and a small group lesson for each day, so that you can differentiate and reach each learner. All the materials are provided, besides books. All the lessons are engaging, low prep, and rigorous for your upper elementary students. Why will these lessons help your students grow? Engagement- I saw that my students needed more engagement and relation to their real life in order to fully understand the skills, so I created these lessons to keep kids excited and involved the whole time. Tiered Approach- We start with a real life lesson, then practice as a whole group, work in a small group, work in partners, and finally work alone. We start with support on the skill and slowly take it away to really push the kiddos. Rigor- The lessons keep kids thinking the entire time and push them to reach their potential. Low-Prep- These lessons just need to be printed, copied, and they are ready to go! Most activities require little work beforehand for the teacher which makes a teachers busy life easier! Monday- Whole group introduction lesson called "Character Survey" where the kids will survey family members to learn about character trait. Then you will use an anchor chart and video to teach. Tuesday- Use a Pixar to practice, read "Emmanuel's Dream: The True Story of Emmanuel Ofosu Yeboah", and do a graphic organizer on character traits. Play a character trait game. Wednesday- Reread the story and discuss the difference between feelings and character traits using a character profile and anchor chart. Completing a writing group project and then have the students present while the other students are identifying the traits and feelings. Thursday- Use pictures to talk about character motivation. Read "The Potato Chip Champ" and work in partners to create character posters. Then, do a poster walk. Friday- Play character trait charades, complete character selfies, and take the assessment. There is one small group lesson per day. You can do this with every group or just do the lessons you think the groups need. You differentiate them by what books you choose. Monday: Play character trait matching with scenario cards. Tuesday: Read a leveled book and practice identifying true and false character traits. 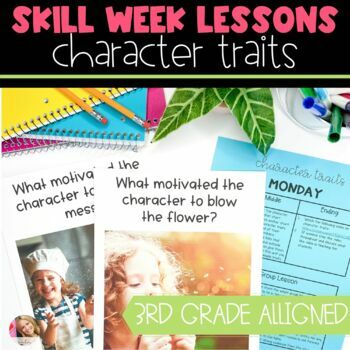 Wednesday: Use a leveled book and complete a character profile that is provided. Thursday: Read a story that is provided and annotate the text based on characters. Friday: Write stories using character traits, feelings, and motivations. 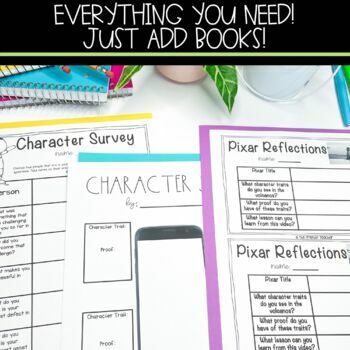 Ashley- "I loved this resource. Each day's lessons were very engaging and well thought out. My students learned so much, and they had a lot of fun!" Tammy- "I can't wait to use this resource in my level 3 middle school classroom next week! 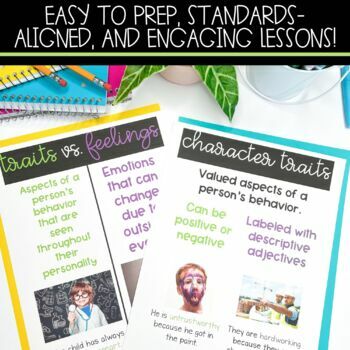 I love the lesson plans, easy prep and colorful images to use! Thanks so much! Teach to Create curiosity- Your lessons are so perfectly guided, easy, and right on target! Love how it’s laid out for a week but easily could be a week or two or a unit if you keep using your strategies! Thank you!!" I love teaching Character Traits now because it is fun and rigorous! The kids are engaged the whole time. They love reading books, watching videos, creating character selfies and more!